Is that a “Psychologist in your Pocket?” is the title for Dr. Michael Carr-Gregg’s upcoming keynote at the 21st Century Learning conference in Hong Kong. Interesting title I thought, so I contacted him for an interview to ask him more about what the title really meant. Well, it turns out, he is a huge fan of the potential offered by our devices (smart phones, watches, tablets) for working with mental health issues among teens. We all know that they, and often we, are always connected to devices, so why not leverage that new reality. Dr. Carr-Gregg discusses the work he is doing using devices to help teens with sleep, distraction, depression, anxiety and more. 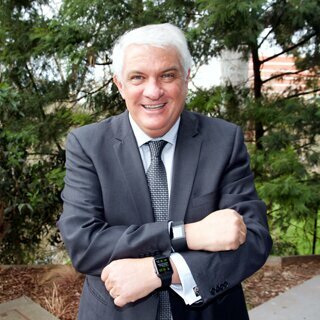 With strong support from the Australian Government and others, he sees a positive future for the use of the devices that might one day halve the suicide rate of teens. Dr Michael Carr-Gregg works as the Managing Director of The Young and Well Cooperative Research Centre, established by the Australian Government Initiative administered by the Department of Innovation, Industry, Science and Research. He is a nationally registered child and adolescent psychologist working in private practice in Melbourne. He is passionate about adolescent mental health, technology and education. His training and approach incorporates cognitive behavioural therapy (CBT), Acceptance and Commitment Therapy (ACT), mindfulness skills and interventions drawn from positive psychology research. He sits on the Board of the Australian Psychological Society and Smiling Mind well as being a Community Ambassador for Big Brothers Big Sisters, Postvention Australia, Playgroup Victoria and is a member of the APS committee for the Special Interest group in ePsychology, a columnist for a number of publications including the Huffington Post, Girlfriend Magazine and is the resident parenting expert on Ch 7’s Sunrise (see videos) as well as Psychologist for the top rating Morning Show with Neil Mitchell on Fairfax Radio 3AW. He is a founding member of the National Centre Against Bullying and Chairs their Digital Literacy Committee.